We thought London had every kind of quirky cuisine or obscure food pop-up covered, but this is the first time we’ve heard of dinners been printed onto the plates. The dishes at Food Ink’s ‘multi-sensory food experience’ are created using a 3D-printer, and produced live in front of the diners’ eyes. Joel Castanye and Mateu Blanch are the chefs behind the nine-course extravaganza, which will be eaten using 3D-printed utensils designed by artist Iwona Lisiecka on 3D-printed chairs designed by Arthur Mamou-Mani. The dinner is only open to ten lucky guests per night and it’ll set you back a hefty £250 to be on the guest list. Tickets go on sale tomorrow at 9am and we reckon they’ll be snapped up pretty swiftly. 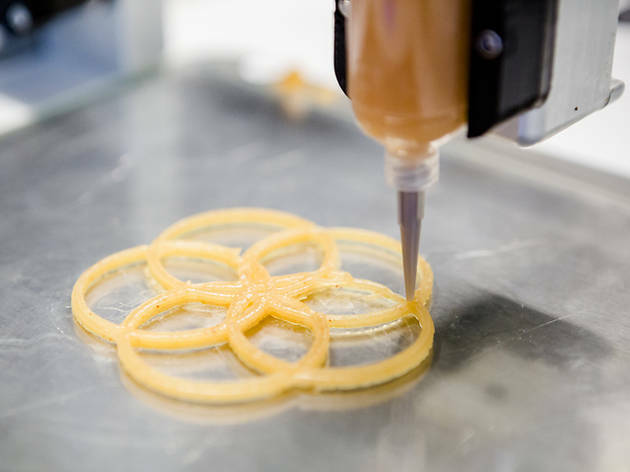 If you’re not willing to part with that much cash, Food Ink will also be hosting two public open days where visitors can sample 3D-printed snacks and have a go on the printers and pens themselves. Food Ink will be at 8 Dray Walk, E1 6NJ. Mon Jul 25-Wed Jul 27. 7.30pm–10pm (VIP diners); Tue Jul 26–Wed Jul 27. 2pm–6pm (public). Book tickets for the dinner here. After another unusual dining experience? Check out what it's like to eat at a naked restaurant. I just want a pen to design unique findings / mountings for semi-precious jewellery. Something different to either having them set in resin, or buying gold or silver findings made by other companies. 3D printing has really changed the way of art. I am a fitness trainer by profession and blog at https://healthoclock.net/. I recently read manufacturers are now using it to develop several components of gym equipment. Nice to see 3D printing has a great future. Great write up! also the food looks lavish. Not many restaurants are doing something like this. But yes many confectioneries and chocolate designers are employing 3D printing service. This certainly gives them flexibility to create wonderful designs, that may not be possible without a 3D printer. Anyway i am sure Restaurants in future will start serving full-fledged 3D printed food. Hands down the best customer service among. I've shopped around, tried three different printers and no one compares to working with allthat 3d. Their quality of work is excellent and over time the printing looks amazing. So happy to have found them at https://www.allthat3d.com/3d-printing-benefits/! Is not true: https://www.facebook.com/foodlabschamberi/?fref=ts was first. Check it!